Maple is a timber species grown up mainly in some cold areas,like North China,Russia,Canada,North American regions.There are mainly two maple species availlable in hardwood flooring market today.One is Canadian hard maple,another one is soft maple(about 25% softer than canadian hard maple).Hard maple wood originated from North America ,mainly from Canada while soft maple is distributed from North Asia to Yunna of South China Areas. The grain of Hard maple is more slimmer than soft maple and color varations is less prominent.The hardness of soft maple is similar to oak but the wood elasticity is better than oak,that's why we prefer to use soft maple flooring on sport stadium,basketball court etc.In hardwood timber flooring market today, soft maple is around 30% less costive than hard maple.Clear A garde soft maple with outstanding pure light yellow hue that you can hardly find from the other solid timber floors. 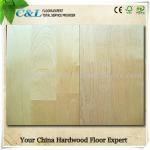 C&L hardwood mainly supply soft maple ,both engineered maple flooring and solid maple flooring. Clear Grade Asian soft maple (hardness 1460psi,higher than oak) solid flooring from C&L hardwood are prefered by many clients. 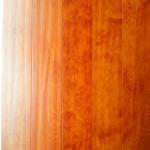 The Asian Maple is properply dried with Moisture Content below 12%,UV coated,with Micro-Beveled Edge along Joint.